Pry up the door latch and unclip the latch rod. Use a flat blade screwdriver to pry up the top of the door pull and the switch panel. Unplug the switch panel from the wiring harness. Remove all the now-exposed Phillips screws. Pry off the door panel and pull it up and over the lock. Carefully peel back the water shield. Remove the stamp plate secured by two screws. Disconnect the window motor lead. Unbolt the seven 10 mm bolts secure the window regulator and motor. 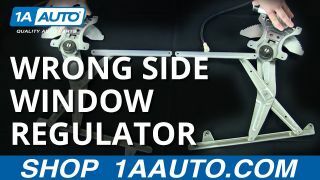 Carefully lower the window and regulator, making sure you donâ€™t cut your fingers. Unbolt the window from the regulator by maneuvering the bolts securing the window to the regulator in front of the access ports in the door. Pull the window up and out, tilting it inwards towards the body of the vehicle to remove it. 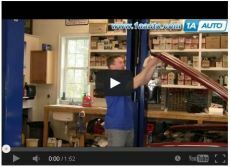 Pull the window regulator out. Slide the regulator into the door and start threading in the nuts and bolts. Tighten the 10 mm bolts with your socket and ratchet. Plug in the switch panel to the wiring harness to move the window regulator up and down so you can access the window anchor points. Lower the window down into the regulator and bolt it in. Test that the window goes up and down ok. Hang the door panel up, make sure your lock button comes through the top. Once you get it hang up, you can look in behind and line up the clips. Feel the pin and then hole, push it in. Make sure that you have your lock rod and your harness coming through, and then install the two Phillip screws that hold near the armrest base. Now you can reinstall the armrest, just push it down, lock it into place. Reconnect your power window switch, slide the back end first then push the front down into place. Reinstall your door handle, push it in, push it back, then walk it into place and then put the screw back in. The trim panel, it goes up top near the mirror and then the little clip in the back to hold it.